Oh my. We’ve got a LOT to look forward to this month–check out what’s happening in February! 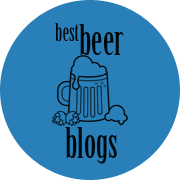 Note: I am also publishing a separate post of “Valentine’s Day Beer Events” that has many more events, so be sure to take a look at that one too! Tue., Feb. 2, 6-8 p.m.: Cheese + Craft Beer Tasting at Factotum Brewhouse (3845 Lipan St, Denver). Sunnyside neighborhood merchants Cheese+Provisions and Factotum Brewhouse are teaming up for an artisan cheese and craft beer pairing! Four distinct craft beer and cheese pairings will be enjoyed,along with a background on the style and history of each cheese and beer and why they are paired. What better way to celebrate Groundhog Day than to repeatedly savor a cheese and follow it with a delicious, fresh beer? Sour Month–all month long at First Draft Taproom & Kitchen (1309 26th St., Denver). First Draft Taproom & Kitchen in RiNo will feature sour beers for the entire month of February. With a minimum of 5 sour taps at all times, First Draft will look to educate guests and enlighten palates with one of America’s growing craft beer trends. The rotating sour taplist will include notable sour beers from breweries like Russian River, Almanac, Crooked Stave, Gueuze Tilquin, and Trinity Brewing, but will also highlight some small craft brewers’ sour offerings as well including Platt Park Brewing, Odd13 Brewing, and Pikes Peak Brewing. In addition, First Draft Taproom & Kitchen will also host a beer dinner with the preeminent sour beer brewery in the US, Crooked Stave, at the end of the month. First Draft’s chef Peter Garner will pair a 3-course meal with some of Crooked Stave’s best and rarest offerings. Details and tickets forthcoming. Wyoming’s Melvin Brewing is celebrating their award-winning 2×4 Imperial IPA across the U.S. on Thur., Feb. 4 with special events at 24 bars from Boston and New York to San Diego and Seattle. The swag, the hip-hop, the ninjas, and – of course – Melvin’s 2×4 will all be out to party. 2×4 is an Imperial IPA with a stupid amount of hops. Checking in at 10% ABV, 2×4 has a light malt base that reveals notes of pine, citrus and tropical fruit. 2×4 has won a gold medal at the Great American Beer Festival, back-to-back Alpha King awards (2nd in 2015) and holds the current World Beer Cup Gold Medal. Melvin’s 2×4 Imperial IPA has only been available on draught at Thai Me Up restaurant in Jackson, Wyoming, until meow! National 2×4 Day is your first (or second) chance to taste this outstanding beer before it launches into wider distribution. Sat., Feb. 6, 7-11 p.m.: New Belgium presents: Lost in the Woods DENVER 2016 at Battery 621 (621 Kalamath Street Denver). Join us this February in celebrating the release of two beloved sour beer vintages: La Folie, the award-winning sour brown ale that launched New Belgium’s wood beer program back in 1997, and Transatlantique Kriek, a wood-aged sour cherry ale brewed in collaboration with Belgium’s Oud Beersel. New Belgium’s Sour Beer program is one of the first and the largest in the United States. La Folie initially rolled out in 1997 with a gold medal at GABF and has since been an anchor for our Sour Beer Program. Every year, Eric Salazar, our Wood Cellar Manager, and Lauren Salazar, our Sour Beer Blender, coordinate a blending of various foeders to make a 100% sour brown ale. Each Year is different, ages well, and will leave you puckering for more. All of the attendees will be provided with 3 delicious sour beers, food from Corner or Gourmet, and a special surprise to take home with you. Please join us and be among the first to enjoy our 2016 sours along with Rapidgrass Quintet providing live music throughout the evening! 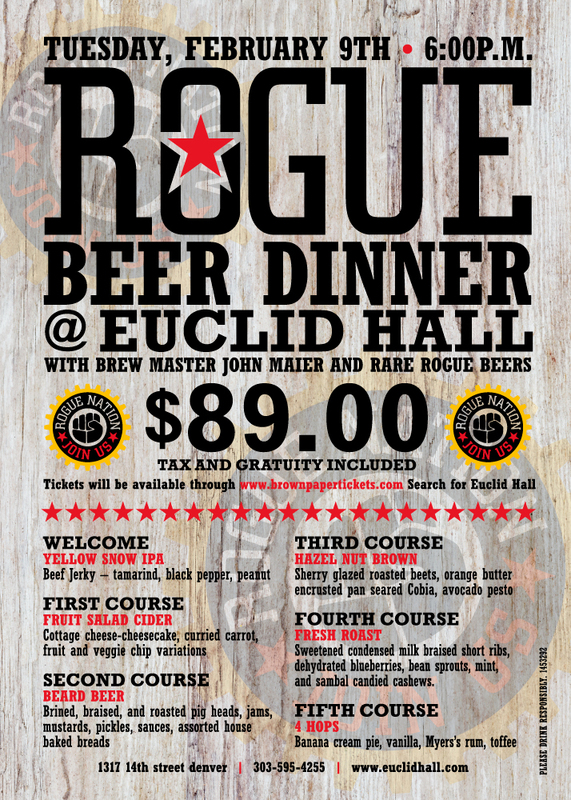 Tue., Feb. 9, 6 p.m.: Rogue Beer Dinner at Euclid Hall (1317 14th Street, Denver). Oregon-based Rogue Ales’ Brewmaster John Maier will bring rare Rogue beers when he visits Denver’s Euclid Hall for a special beer dinner on Tuesday, February 9th at 6:00 p.m. kicking off his four city tour of America. Chef Jake Grant has paired his eclectic five course menu with six selections from the Rogue collection. The dinner is $89.00 per person including tax and gratuity. Maier hasn’t been to Denver since the 2005 Great American Beer Festival. He joined Rogue just a few months after construction began on Rogue’s Bayfront Brew Pub in 1989. The second course features Beard Beer, brewed with a yeast created from Brewmaster John Maier’s beard. John has had the same old growth beard since 1978 and for over 18,000 brews, so it is no great surprise that a natural yeast ideal for brewing was discovered in his beard. Six courses and plenty of beer… this is a night you won’t want to miss! Wed., Feb. 10, 6-7 p.m.: Epic Beer School: Cheese, Chocolate and Beer at Epic Brewing (3001 Walnut St, Denver). If you share a passion for chocolate, cheese or beer, you will love this class! We will go over how to build cheese and chocolate boards and pair each with beer! Plus, THIS CLASS IF FREE! Just show up shortly before the class begins and put your name on the list! It will cap off at 20 people, so first come first serve. Thur., Feb. 11, 6-8 p.m.: Belgian Tripel Tapping Party at Gordon Biersch (1 West Flatiron Circle, Broomfield). Gordon Biersch has announced it will be tapping its first seasonal beer of the year, Belgian Tripel, on February 10th. Inspired by the monastic brewers of Belgium, this golden ale is defined by an elegantly complex spiciness and subtle notes of stone fruits, and reflects the restaurant’s unique take on the popular Belgian style. The new beer will be available until March 20th. Coinciding with the Belgian Tripel release, Gordon Biersch has also debuted seven all-new core menu appetizers, each of which are bar-centric and pair perfectly with the seasonal beer. Feb. 12, 13, & 14: Ratio Beerworks 1st Anniversary Party at Ratio Beerworks (2920 Larimer St., Denver). It’s time to celebrate Ratio Beerworks 1st anniversary! We have an awesome weekend of wild events planned and can’t wait to see you in the taproom! Get ready for special tappings, bottle releases, firkins, comedy, live music, giveaways, brunch and food trucks. We plan on partying throughout the weekend so mark your calendar! More details will be posted soon, so stay tuned! We can’t wait to party with all of you that made this year so much fun. Wed., Feb. 17-Sat., Feb. 20, 5 p.m.: Girl Scout Cookie Pairing at Renegade Brewing (925 W 9th Ave, Denver). It’s that time of year again! Time for Girl Scout Cookies, and what better way to enjoy them than with some beer! Join us Wed.-Fri., February 17-19 at 5pm – close, where $12 gets you four 4 oz pours of beer paired with four Girl Scout cookies. RSVP here so we know how many cookies we need to order! Buy tickets here, or purchase in the tap room for $10. 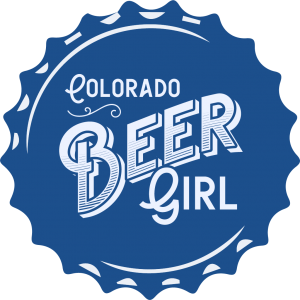 Tue., Feb. 16, 6 p.m.: Women’s Only Craft Beer Classes 2 of 3 at Factotum Brewhouse (3845 Lipan St, Denver). Well now you know your ABV from your IPA. You have a better understanding how beer is made and that all dark colored beers do not taste like coffee. 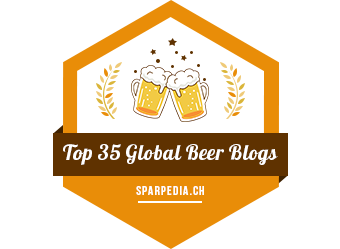 You’ve probably even ordered a beer at a brewery based off of its IBUs. That means you are ready for Class 2! In this second class we will delve deeper into the nuances of all the different craft beer styles and the history of popular beer regions from around the world. All three of these courses are designed just for women (by women), who are interested in learning more about craft beer. Join us for these low key, friendly, no pressure, and FUN sessions. All classes taught by a female in the industry. All classes include multiple tastings of the subject matter and snacks. All classes allow for plenty of networking and meet and greet time. Fri., Feb. 19-Sat., Feb. 20: Goldspot Brewing 1st Anniversary Party (4970 Lowell Blvd, Denver). We’re turning 1! Come help us celebrate. 2 days of special beer tappings, including our whiskey barrel aged Black River Imperial Stout! Food from two of our favorite food trucks, Matt’s Snack Shack (Friday) and Bakin Bakery (Saturday)! Live music from Regis’ own Souled on Saturday! Random giveaways and prizes during the day. Stay tuned for more info throughout the month. See you guys then! Sat., Feb. 20, noon-10 p.m.: Cheers to ONE Year! at Factotum Brewhouse (3845 Lipan St, Denver). On Saturday Feb 20, we’re hosting a bash; sun or snow! Music by Modern Moustache in the afternoon and Carnie Bums in the evening! Special Tappings – some of your past favorites that have been hanging out in barrels as well as some staff curated brews! Free Anniversary Glassware &11 Free Beers to the first 100 attendees! PRE-PARTY with us on Friday night with Electro Hawk! **For this one day, we ask that you leave Fido at home to chill on the couch while you come imbibe and eat and dance. Firkin Stout Month–all month long at Dry Dock Brewing (15120 E Hampden Ave., Aurora). Stout Month, which originated at Mountain Sun Brewing Company in Boulder, is now an annual statewide tradition. We’re celebrating with a month full of specialty stout firkins at each of our locations, including Maple Bacon Breakfast Stout, Banana Split Stout, and Bourbon Oaked Vanilla Cherry Stout. Now in its 23rd year, Stout Month has become a Front Range phenomenon. A dozen taps at all five Mountain Sun locations will be devoted to local and regional versions of this rich, thick, dark ale. Again this year, Stout Month will feature only Colorado stouts in celebration of our thriving suds scene. Stout Month 2016 is filled with more stouts than ever with 29 Mountain Sun stouts and more than 30 guest stouts from 25 different breweries. And the most exciting part of this year’s celebration is it’s a leap year, so you’ll have an extra day to enjoy the stout festivities. Sat., Feb. 27, 11:30 a.m.-1:30 p.m.: February Brewer’s Brunch at The Corner Office with Odell Brewing (1401 Curtis St., Denver). Attendees will start the meal with savory chicken + bacon-cheddar waffles paired with Myrcenary Double IPA. For the second course enjoy the Runoff Seasonal Red IPA paired with an IPA brined pastrami and slaw on pumpernickel. For the third course, things start to get a little sweet with a brown butter crepe with duck confit and sour cherry reduction paired with Friek Sour. And for the final course, indulge in a stout ganache stuffed beignet paired with Lugene Chocolate Milk Stout. Mon., Feb. 29, 7-8:30 p.m.: Ratio Beerworks Leap Year Day Event at Ratio Beerworks (2920 Larimer St., Denver). Leap Year Day, February 29th, comes once every 4 years so we’re marking it with a craft beer and “out of your mind” potato chip (we’re not talking pringles or lays) pairing at Ratio Beerworks. Recently named as one of the top new area taprooms of 2015, we’ll explore Ratio’s Beer with pairings. We’ll also meet their new female head brewer Ali Benetka. The night will feature a 4 taster flight of Ratio Beer including a Belgian Quad and food prepared by Kyle Morgan of Morgan Handmade Rations. Because this event is on Leap Year Day, we’re adding a fun twist. Traditionally, this day was known as “bachelors day” and men were required to pay a penalty if they refused a proposal from a woman. In honor of that tradition, our members are allowed to invite a man to attend this event with them. This guest would require a second ticket/RSVP for the event. Ticket price for this event is $18 per person. To RSVP click here.